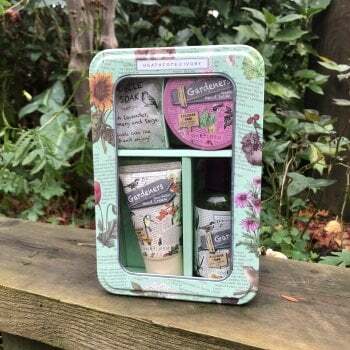 This Heathcote & Ivory relax and renew gift tin from Ruddick Garden Gifts would make a fantastic present for anyone who loves working in their garden. The handy re-usable decorated tin contains four fab treats for gardener's. The 50ml shea butter hand cream is enriched with vitamin E to hydrate tired hands, blended with essential oils of lemon, sweet orange, peppermint and spearmint which leaves hands feeling soft and lightly fragranced. The invigorating 35g muscle soak is made with natural mineral salts and essential oils of rosemary and lavender to help ease tired muscles, The 100ml bath relief soak has eucalyptus and relaxing lavender and will fully rejuvenate after a long day in the garden and the rhubarb hand salve is formulated with aloe, chamomile and rhubarb which will soothe and condition the skin.